Limestone (mineral), a common sedimentary rock composed primarily of the mineral calcite (CaCO3). Limestone constitutes approximately 10 percent of the sedimentary rocks exposed on the earth’s surface. It forms either by direct crystallization from water (usually seawater) or by accumulation of shell and shell fragments. In the first case, it carries a record of the chemical composition of seawater and it provides evidence of how that composition has changed with time. In the second case, limestone provides a record of the evolution of many important fossils. Limestone usually forms in shallow water less than 20 m (70 ft) deep and thus also provides important geological information on the variation in sea level in the past. Limestone rocks are frequently riddled with caves. 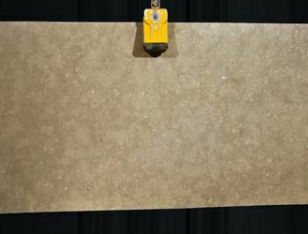 Limestone is an important building stone and is used to make cement and concrete.